Aviation Updates Philippines - The Philippines' leading low-cost carrier, Cebu Pacific Air, was named as the 'Best Low-Cost Carrier in Asia-Pacific' by the leading aviation think tank, the Centre for Aviation (CAPA). The award was given during the recently concluded CAPA Aviation Awards for Excellence in Singapore. "Our LCC of the Year has endured a tumultuous period in its home market, but maintained its focus and had the highest operating profit margin in the Asian airline industry," Centre for Aviation Executive Chairman Peter Harbison said. "The carrier has launched a long-haul operation which strategically improves its long-term position by opening up new markets, while quickly responding to the challenges in this segment," he added. With Cebu Pacific's Airbus A330-300 fleet, it launched new long-haul flights to Dammam, Riyadh, Kuwait and Sydney. It currently operates flights to 62 destinations on 90 routes, utilizing a fleet of 51 aircraft which is one of the most modern fleets in the world. Its network spans Asia, Australia and the Middle East. According to the Centre for Aviation, Cebu Pacific's alliance with Tigerair Philippines, and its ability to adapt as competition intensifies. It helped Tigerair Philippines in returning into profit by making their flights available in Cebu Pacific's website and also leasing some of its planes to the airline. The CAPA Awards are independently researched by CAPA's leading team of analysts, then selected by an independent international panel of advisors. It is not based on customer surveys, popular votes or sponsorship. 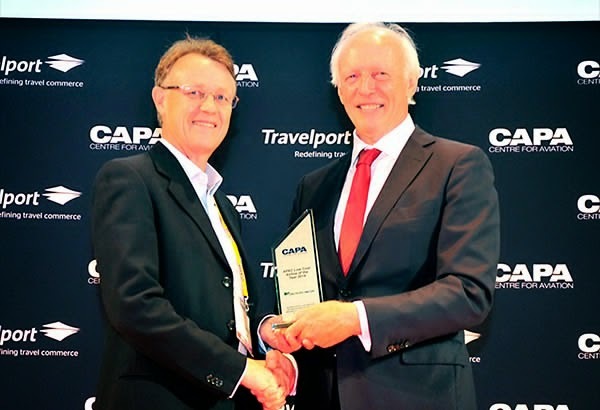 "The Cebu Pacific team is honored to be recognized by CAPA. We will continue to approach growth conservatively and responsibly in order to build a sustainable airline business. Ultimately, this sustainability will allow us to expand to more destinations, making our low fares available to more people," Cebu Pacific Air President and Chief Executive Officer, Lance Gokongwei said. Cebu Pacific Air is the largest carrier in the Philippine air transportation industry, offering its low-cost services to more destinations and routes with higher flight frequency within the Philippines than any other airline. It operates over 53 aircraft including ten Airbus A319-100s, thirty Airbus A320-200s, five Airbus A330-300s, and eight ATR 72-500s. Between 2015 and 2021, Cebu Pacific will take delivery of eleven more brand-new Airbus A320, thirty Airbus A321neo, and one Airbus A330 aircraft.